Ruidoso, located in south-central New Mexico, is a mountain resort and one of the fastest growing towns in New Mexico. Its population of just under 10,000 (more than double that number live in the surrounding area) grew 18% from 2000 to 2008. ENMU Ruidoso Campus is a two-year community college here. Major development projects in Ruidoso include large housing subdivisions, condos, and retail establishments. There is good skiing nearby at Ski Apache. Ruidoso Downs is a suburb and home to Ruidoso Downs (flat) horse racing track, the Billy the Kid Casino, and the Hubbard Museum of the American West. Ruidoso gets its name from the creek running through town, Rio Ruidoso (noisy river). 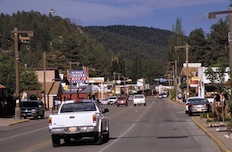 Photo of downtown Ruidoso courtesy of Wikipedia and Dennis Adams.